when Richard O’Connor purchased the charter rights to a collegiate summer baseball team in the Clark Griffith Collegiate Baseball League. The prior team was named the Southern Maryland Battlecats and played their home games in Charles County, Maryland. Maryland Community Baseball, Inc., the parent corporation of the Thunderbolts, was formed as a non-profit, tax exempt 501(c)(3) organization to promote youth baseball in the Silver Spring and Takoma Park areas. 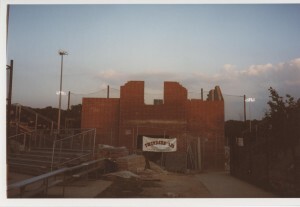 In June of 2000, he new team began play at three different locations in Silver Spring. From 2000 to 2004, the Thunderbolts played in the Clark Griffith Collegiate League. In 2005, the Thunderbolts moved to the Cal Ripken Sr. Collegiate League. The Thunderbolts were League Champions in 2006 and Co-Champions in 2005. They have also won the Montgomery Cup (sponsored by the Gazette Newspapers) twice since 2005. Maryland Community Baseball Inc. signed a 20 year license agreement with the Maryland National Capital Park and Planning Commission in 2002 to play all home games at Blair Stadium. Where are Silver Spring and Takoma Park? Silver Spring and Takoma Park are two of Washington D.C.'s most robust and entertaining suburbs. The two communities sit on the northeast border of the District of Columbia and are just a half hour drive from the White House. When it comes to professional baseball, Silver Spring and Takoma Park truly get the best of both worlds. Both Nationals Park and Oriole Park at Camden Yards are less than an hour away from us by car. Other nearby attractions include the shops and restaurants of Georgetown, the Westfield Montgomery Mall, the Smithsonian Museums, the monuments of Washington D.C., the waterfront scenery of Annapolis, and much more! Q: How are players recruited? A: Thunderbolts Baseball is an eleven month operation. Our coaches begin recruiting players in early September for the following season. Players are recommended by their college coaches. We sign contracts with about 80% of the players by mid-November. In early December, Thunderbolts staff contact parents and players to inform them of the schedule and request player and insurance information. From January to April, Thunderbolts volunteers begin preparing the team’s brochures, advertising, fund raising campaigns and game day programs. The Board of Directors (all volunteers) meet monthly to direct the operation of the team. In May, host families are recruited, players are contacted and the final preparations for the season begin. Q: What does it cost to run the Thunderbolts each year? A: The budget for the 2019 season is approximately $70,000. That total includes the following: coaches salaries and expenses, equipment, balls, wooden bats, uniforms and medical supplies (in 2018 the Thunderbolts used 77 wooden bats at a cost of $44 per bat, and 44 dozen baseballs at $4 per ball), field rentals, insurance and gas expenses, advertising, league fees, printing costs, registration fees, office expenses, concession stand operations, camp expenses and loan payments.